The “desk” is actually just a configuration of the same set used for “Full Measure with Sharyl Attkisson” in the group’s Washington, D.C., studios. The group hasn’t invested the resources in a dedicated set — yet. 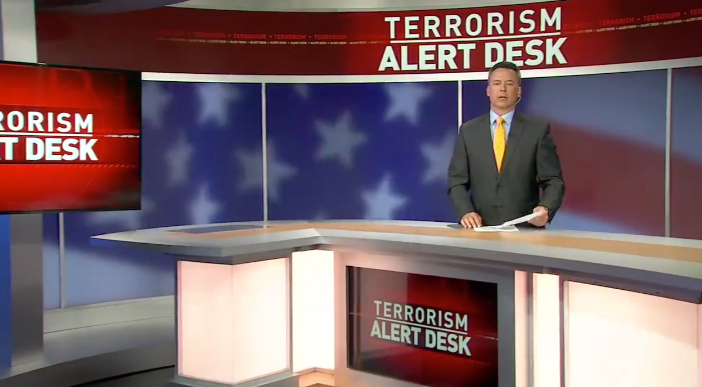 Sinclair’s “Terrorism Alert Desk” is used to deliver terrorism news updates that air on its stations across the country. Branded as the “Terrorism Alert Desk” through the use of on-set monitors and video walls. Bright red with bold typography was chosen for the “alert desk” title card, with a blurred American flag backdrop behind the anchor. It’s not uncommon for networks to brand coverage of big stories, including the terror attacks in Paris, but this branding seems to hit the next level with a name that induces fear and the implication that terrorism is becoming such a part of our lives that stations need a “desk” just for covering it.